I may have been a bit of a diva as a child. I could never win the biggest hair contest in high school, what with the board-straight (or bored-straight?) locks I was blessed with, but that didn't stop me from trying every now and then. have a groooovy halloween, baby! I am guessing that this is Halloween 1977. I must not have had any candy yet. Three year old little momma. Twentysomething big momma. Good thing I'd practiced! This one is by special request for Misty, aka Sassybutt. This is my stylin' self, circa 1978, in Salt Lake City, UT. One of my new projects is to sort through and scan the treasures in this huge box of pictures my mom left at my house. I'll let you know when they're all uploaded for your viewing pleasure. Oh wait, what do we have here? It's Ben, bringing in the 1980's.....nice hat, eh? 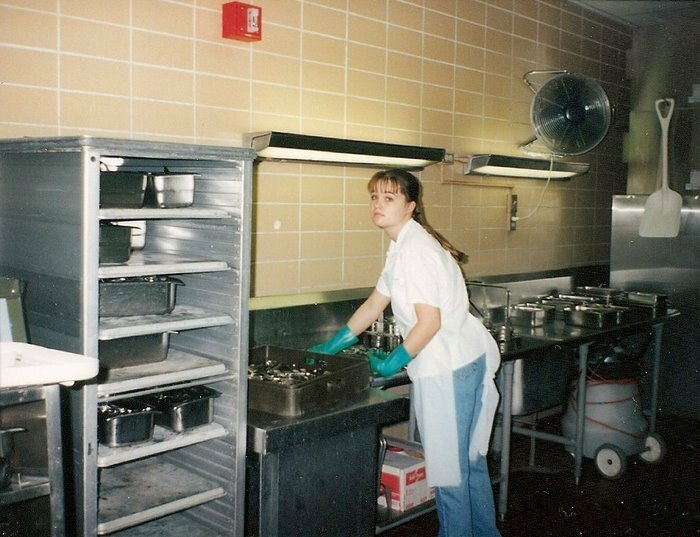 The 5:30 AM dishroom shift at the BYU dorms (fall semester of my sophomore year). Aahh, the memories. The highlight of this job was to throw leftover baked potatoes into the air, and then use the extremely high-powered sink sprayer to shoot them into oblivion. I was lucky enough to graduate to an afternoon shift the next semester. And hot diggity, by the summer I was working the line -- shoveling the slop onto plates instead of spraying the slop OFF of the plates.